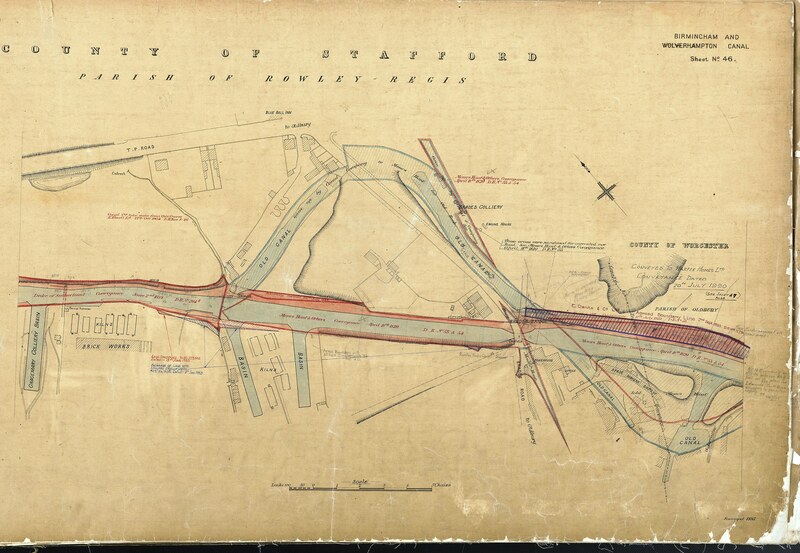 (I) Could you please supply me with a historic deed plan/map of the section of canal between Gower Branch and Brades Bridge on the Birmingham Old Mainline canal. (II) Can you confirm the earliest dredging records that British Waterways still hold for the areas between Titford Locks and Dudley Port on the BCN network, and the retention policy, e.g for how many years are they kept for and what happens to them after that? (III) Confirm how often inspections are carried out on this network and the earliest inspection records that you still hold for between the same two points and the retention policy/subsequent end life for these. I believe that the BW area in question was once known as British Waterways South Western Division? (I) As part of tracing the historic journey between Trinity Steet and Rattlechain lagoon by Albright and Wilson contractors, The Gower Branch is a key piece connecting the Old and New mainlines. (II) We wanted to see what records British Waterways would admit to still having- given that we know that they disposed of their dredging waste at Rattlechain lagoon, from this network and from this whole potential area. We wanted to know volumes and also the policy/protocol of keeping these records- baring in mind that they wanted to dispose of around 250 tonnes per year into Rattlechain lagoon from historic correspondence with AW. (III) We wanted to see what inspections BW carried out on this network and how frequently these were carried out, and whether this had changed over time. We also wanted to know how long they held on to these records with a view to obtaining them if possible- to see what they said in reation to water quality/pollution around the network- particularly around Trinity Street and Rattlechain Lagoon. (IV) We wanted to see these records and what they contained. (I) The historic deed map was successfully obtained. Several files were attached as part of the request which were fairly incomprehensible, and there is difficulty in interpretation of what they actually show. We’ve provided one link below, and the rest can be inspected from the main request link. (I) Sheet 46 shows Brades Bridge and Brades Colliery. Several more now infilled basins, as well as the line of the very old canal also now infilled. It connects to sheets 47 and 45. (II) The lack of official records is not surprising, but also worrying. Changes in dredgings waste disposal legislation make obtaining historic data even more difficult. Unfortunately chemical waste has a long profile and memory, longer than that of planners and developers who like to build on “brownfield land”. (III) As the period in question that we are concerned with, when Albright and Wilson’s waste was still being carried, these areas would have been dredged many times in the intervening years from the recent periods that British Waterways provide here. Their environmental fate,where these went and what they contained is another matter entirely. THERE ARE NO RECORDS BEFORE 1997 KEPT. (IV) As the set of diagrams and figures are impossible to comprehend, we do not wish to labour talking about them, as they do not relate to the area or time in question that we are interested in. What it does show is that the process of record keeping is now considered more important than the remiss periods of before the 1990’s. Technology has improved instead of the blind dredging that went on such as ad hoc dredging and dumping into Rattlechain lagoon where no real records or volumes of waste were being recorded. This can only be a good thing and further stringent regulation needs to be maintained, along with the canal network.